Bio-Shock™ is a powerful biological treatment to help restore beneficial bacteria in your lake or pond. The accumulation of organic waste/pond muck, dead leaves, plants and fish waste build up during the Winter months reducing the naturally occurring microbes in your lake or pond. Replenishing bacterial colonies that have been lost over the winter, in early spring, will increase nature’s bio- degradation process, creating a sustainable and stable aquatic ecosystem that’s clear and safe for recreational use. A 1 pound bag of Bio-Shock™ Bacteria Booster will effectively treat up to 1 surface acre of water, regardless of water depth. 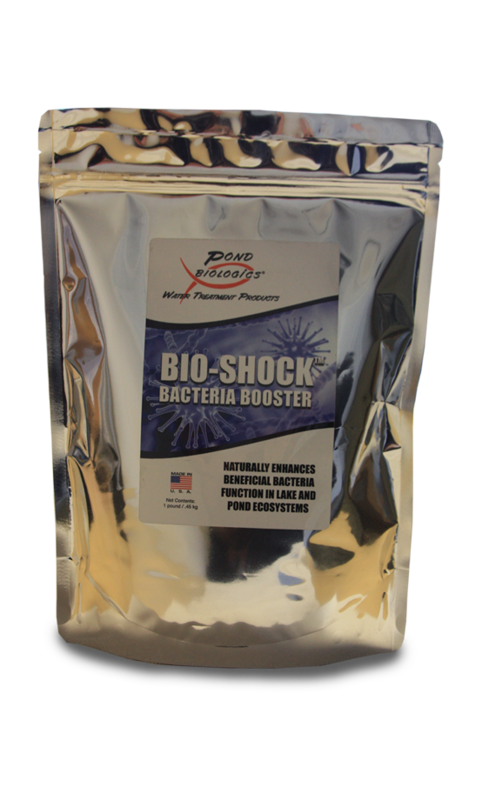 Mix Bio-Shock™ in a clean bucket of lake or pond water. Stir until powder is diluted or for approximately 1 minute. Pour in multiple locations around your lake or pond, or near a fountain or boil of an aerator for maximum dispersion.